What better way to experience Christmas than with the big cheerful bearded man in a red suit and his elves? Santa Claus resides in Finland near the Arctic Circle. Santa’s original home is on Kovatunturi Fell, where you can still experience the Christmas charm, but Rovaniemi has now become his official hometown, where he welcomes guests to his magical world at the Santa Claus Village. However, Santa has many helpers that can visit families around Finnish Lapland. 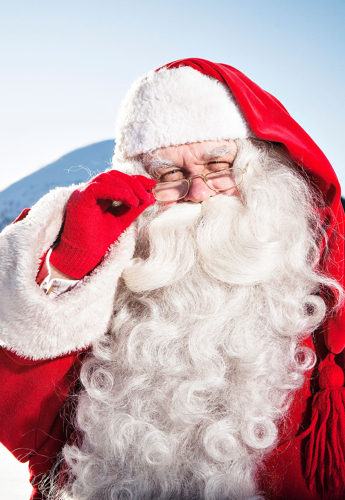 The Northern region of Finland has many opportunities to show your children Santa’s magic. At 50 Degrees North, we take pride in showing you the authentic Lapland away from the crowds. You can enjoy the excitement of local winter activities and Lappish traditions. Several of our trips include meeting Santa in private family visits to your lodges. See our complete range of Santa holidays. On our Christmas trips, you will also have the opportunity to engage in various Santa activities such as reindeer sleigh rides and feeding reindeers with Santa. 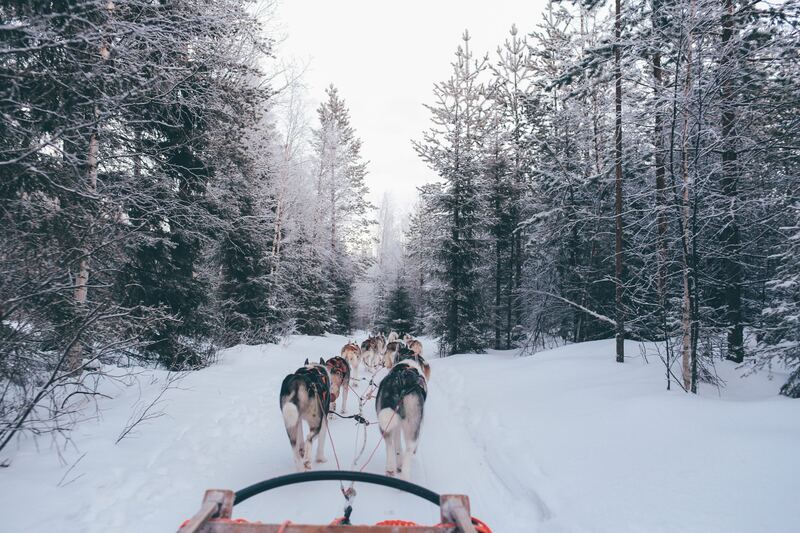 Older children will enjoy snowmobiling in the Finnish forests and husky sled rides. Nature permitting, you may also be lucky enough to catch a glimpse of the Northern Lights (Aurora Borealis), specific tours focusing on searching for the Northern Lights are also available with 50 Degrees North. During the Christmas period, the chances of experiencing the Northern lights are quite high as they light the sky on average 1 out of 3 nights in this region above the Arctic Circle. We have a different array of accommodation options, whether you want to be in the hustle and bustle or secluded. We can also combine a Lapland stay with some time in a capital city to do some Christmas shopping or post Christmas for a spectacular New Years Eve celebration. You can enjoy a white Christmas holiday with a wide variety of family fun activities. As well as more adventurous outside options, you can cosy up by the fireplace and play games, build snowmen and make angels in the snow or simply indulge in the pure relaxation of spa and sauna packages. Indulge in a true Finnish custom, the Sauna, for pure relaxation and wellbeing. Contact us at 50 Degrees North and let us create your dream White Christmas holiday.